Shopify store owners find it difficult to aggregate data from their multiple ecommerce stores/paymnet gateways and view the respective stats in Shopify reports. But now with this in-depth reporting tool called Putler, it won’t be the same. Why you need a better Shopify reporting solution? The basic Shopify reporting will only give you an overview of your dashboard and not the required insights. If you want are having multiple Shopify stores, other ecommerce platforms and payment gateways, you must opt for another alternative to view accurate & in-depth analytics and insights. Shopify has done a good job in reporting and analytics section. It brings up the required metrics related to sales, customers and visitors. The basic reporting solution will give you just an overview dashboard and finances reports(including payment and taxes). Sales reports- Orders, returns, taxes, etc. Customers reports- At-risk customers, returning customers, loyal customers, etc. Acquisition reports- Visits over time, marketing campaign, etc. Behavior reports- Top online store searches, website cart analysis, etc. If you have multiple Shopify store and need to view stats, you won’t be able to view combined stats together. You need to view stats for each of your store individually. Since you are using Shopify, you can only connect your Shopify stores. If you are using another e-commerce platform for selling or need to connect payment gateways to view the respective business stats, you can’t connect them into Shopify. Shopify gives you reports only in a single currency. If you have multiple stores accepting different currencies, the transactions do not get converted into that particular currency. Shopify doesn’t provides any reports if you are into a subscription business. 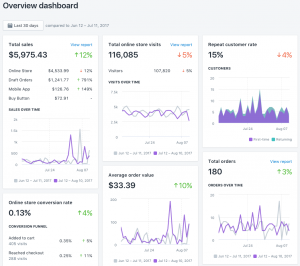 MRR, LTV, Churn rate, ARR, and other important subscription metrics are not available within Shopify reports. For full access to Shopify reports, you must be on a higher plan of either $79 / mo or $299 / mo. Otherwise, if you are on basic plans, you need to be settled with just the overview dashboard and finances reports. Overcoming Shopify reporting limitations – Is Putler the Best Reporting Tool for Shopify? Putler is a complete analytics and reporting solution for your online business. 153+ in-depth metrics, customers and products insights, expert recommendations, etc. makes it a hot favorite among business owners. Putler in addition to basic reporting and sales analytics also has many unique features which you won’t find in shopify. No switch over to multiple accounts: Unlike shopify where you need to see individual data and add data manually from each account for total value, Putler provides accurate aggregated data as well as individual data for each Shopify store. Accurate consolidation of multiple platforms: Not just Shopify stores, you can accurately combine multiple ecommerce platforms, payment gateways and view your business stats for each one of them. Automatic deduping: Combining multiple accounts leads to duplication of data that yields error in results. But Putler takes care of that easily. Multiple currency support: Dollars, Euros, Yens, Rupees… Putler supports & automatically converts currencies to give you a global, single currency dashboard. Google Analytics integration: Putler integrates with Google Analytics and fetches instantly useful data like top webpages, bounce rate, traffic sources to your site, etc. Customer & product insights: At-risk customers, loyal customers, product leaderboard, product-vise refunds, etc. 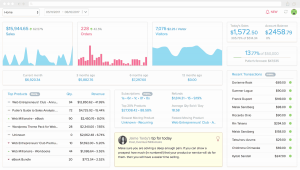 Subscriptions reports & analytics: Putler provides subscription reports for your shopify store. MRR, Churn rate, ARPU, LTV, etc. Shopify is one of the best e-commerce platform. It’s reporting is also good except for a few drawbacks mentioned above. Hence, if your want to grow your ecommerce business, you need to look beyond traditional Shopify reporting and that’s where Putler comes into picture.